There is a silence about the works of painter Vonn Sumner. His canvases ask his viewers a question that takes a moment to consider: do you want to laugh, or cry, or both? 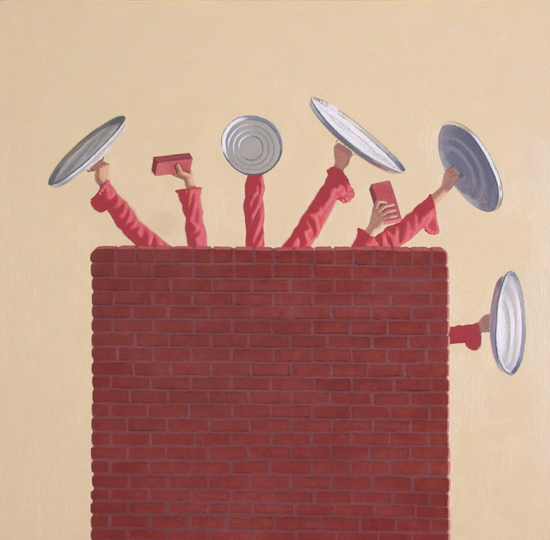 Vonn Sumner, "Defense," 2013, oil on panel, 18 x 18 inches Vonn's upcoming show "Somewhere Else" features a suite of paintings that form a kind of personal Commedia dell'Arte, whose main actor has a tragic, muted air. Sumner is wise enough to know how to engage you in his theater and also smart enough to stand back and let you react on your own terms. 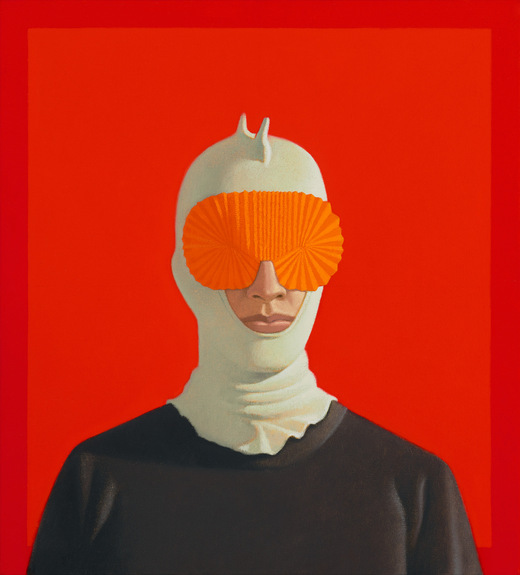 The paintings are generous, funny and just a bit opaque. Sumner, whose father Richard ran a Palo Alto frame store and gallery grew up looking at art and thinking it over very carefully. 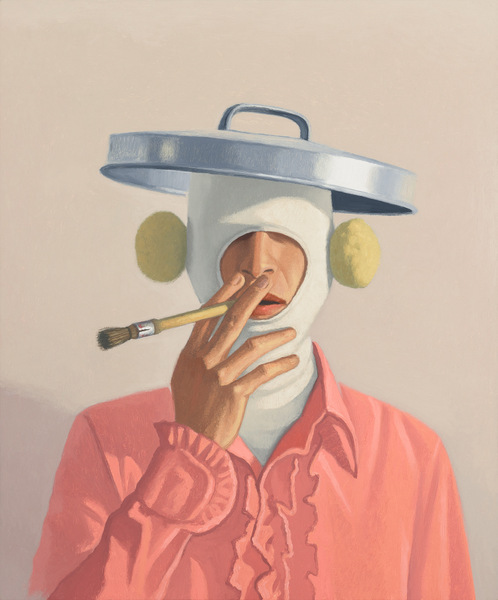 Echoes of Bay Area painting, flavors gleaned from Morandi, Guston and Magritte and a hint of Buster Keaton come together in his recent works through the filter of a sly, discerning intelligence. Vonn Sumner -- Photo: Eric Minh Swenson Vonn, you grew up in the Bay Area and got your MA at UC Davis. How have the traditions of Bay Area painting stayed alive in your work? 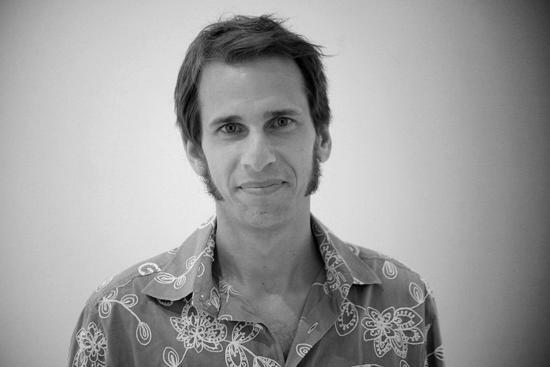 In many ways: There was a David Park show at the Palo Alto Cultural Center when I was in high school that was a life changing event. I went to see it every weekend, it had a physical effect on me. Also, those painters had a love of art history, of the traditions of painting, but also could not ignore the new artistic developments and anxieties of their time. With the 'Bay Area Figurative' painters especially, there was a desire to bring the processes and premises of non-objective painting together with the timeless project of representing the human form. That same question is something I try to grapple with every day in my own way. Your images often manage to mix humor and commentary. Is it important for you to have both of these elements in everything you do? Well, they need each other, don't they? Lisa Simpson needs Homer; Chuck D needs Flavor Flav; Karl Marx needs Groucho. Social commentary alone can become didactic, orthodox, simplistic and boring. Pure silliness and absurdity can become nihilistic and trivial. I am for the complexity and contradictions that come when both of those elements are simultaneous--I think that is more honest, more fully human, and therefore more subversive. 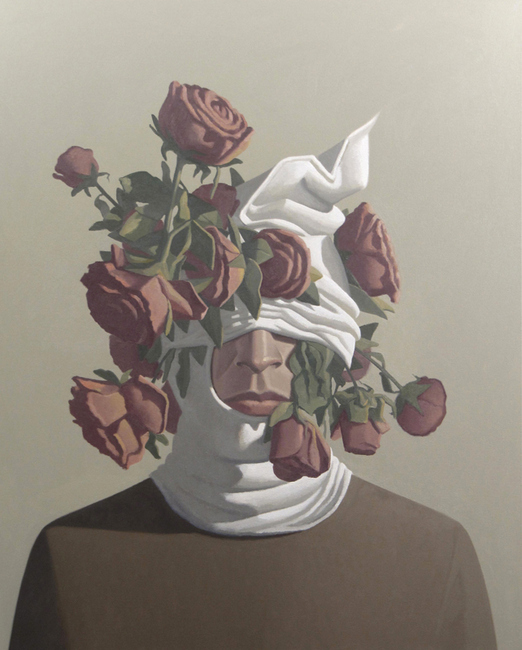 Vonn Sumner, "Reliquary," 2012, oil on canvas, 60 x 48 inches Your painting "Reliquary" includes a shrouded figure decorated with roses. What are some of the ideas behind that image? For me, the decisions in making a painting are largely intuitive. There is no literal idea or narrative I am trying to execute or illustrate. I can say generally that I work with materials and imagery that feel "right," and that I work toward an image that resonates with me at the time. I'm also interested in breathing new life into old conventions, like portraiture. With "Reliquary" in particular, it felt both ridiculous/absurd and also somehow melancholic or mournful. Vonn Sumner, "Neo-Byzantine," 2013, oil on canvas, 20 x 18 inches Many of your recent works appear to be self-portraits: are they? I actually don't think of them as self-portraits, even though I am often using my own body/face as the figure. Instead, I think of them as just "heads" or "figures" in a generic sense. An analogy might be that a filmmaker can write a script and then act in a particular part because he knows what he wants for the role more than the role is autobiographical or about "self." Also, since I am often putting the figures in a state of potential humiliation, I think on some level I feel more comfortable doing that to myself than to other people. Since we don't -- as far as I know -- choose our bodies when we are born, I think of it almost as a kind of "readymade" or a given; like Jasper Johns using the stencil letters and numbers you get from a hardware store, a kind of neutral decision in some way. Bruce Nauman's work was influential in this regard, as was Joseph Beuys, though he was more overtly "autobiographical"-- if perhaps fictional. I do take photos, but don't stay too faithful to them and throw them out as soon as possible so as to let memory and invention take over and just be present to the painting. Can you tell me the names of artists who have influenced you? What have you borrowed from them? That is a dangerous question, I could talk all day... First, I will say that I give myself permission to steal from anyone and anything. My job is to make it my own. But some of the main influences: Philip Guston, Balthus, Giacometti, de Chirico, Morandi, Goya, Piero, Giotto, and the Italian "Primitives" - especially the Siennese like Sassetta, Duccio, etc. Among current painters, I like Peter Doig as well as the 'New Leipzig School' painters from Germany, I feel a certain kindred spirit with some of them. But I also love abstract painters like Sean Scully, Terry Winters, Brice Marden, Nozkowsky. I loved Amy Silman's last show in New York, I think she has found an exciting way to address the question of how to combine abstract painting and figuration. I have to add that many of my main influences are from cartoonists and filmmakers. People like Daniel Clowes and Chris Ware, Art Spiegelman, R. Crumb. The Marvel comics of the 80s had a profound effect on me growing up. At Davis, my teacher/ mentor Wayne Thiebaud introduced me to George Herriman's "Krazy Kat." And Wayne made it clear that he took that very seriously: that cartoonists and "commercial artists" like that were not to be condescended to but to be seen as artistic equals. That had a huge impact on me and validated how much comic books and even children's book illustrations had influenced my wanting to draw in the first place. Some of the earliest and most impactful pictures that anyone sees are the drawings and paintings in children's books. Similarly, I think Alfred Hitchcock and the old Film Noir movies are probably a major influence on my work, as is Buster Keaton. I worship Buster Keaton. Vonn Sumner, "Action," 2013, oil on panel, 18 x 17 inches You have explained that your work "attempts to reconcile the exterior objective world with my subjective experience of it." Can you expand on that? It's hard to talk about. I remember since childhood being struck by the distance between what was going on in the "objective" /observable world and what I was feeling and experiencing in my "subjective" inner world. I think that is one of the main reasons that artists make art: to bridge that gap and communicate, to bring what is inside and show it to the outside, to make the invisible visible. And this is not only an intellectual or an emotional thing; this is also about the physical experience of being in a body. Painting is uniquely equipped for addressing the body, for projecting the physical experience of the painter and producing an empathy in the body of the viewer. 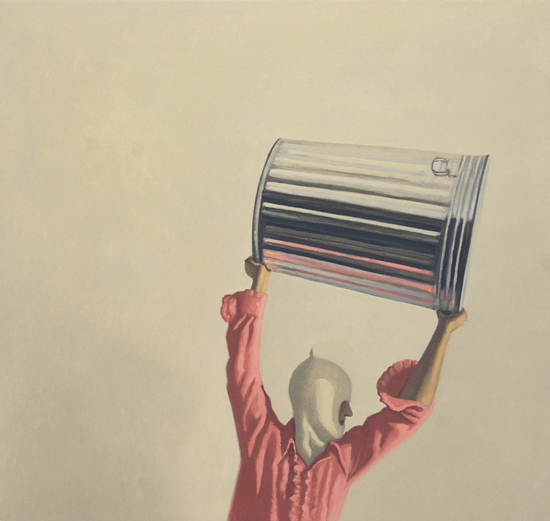 Vonn Sumner, "Parlance," 2013, oil on panel, 24 x 20 inches What direction do you expect your work to take in the future? Of course, I don't know, and the not-knowing is part of the point. In general, though, I hope to grow and push my work into a place that I can't yet envision. More specifically, one thing I can say is that I have always really been interested in the territory where painting and drawing overlap and the boundaries between the two disciplines are blurred. That is part of my interest in Giacometti, and I think late Guston addresses that. Picasso's black and white paintings deal with that directly. And I am increasingly interested in the ink painting traditions of China and Japan. The directness and simplicity of that painting is amazing. So there is something there that I have yet to fully explore and I hope to find a way to invent my own version of that painted-drawing or drawn-painting thing. That is very exciting territory to me.